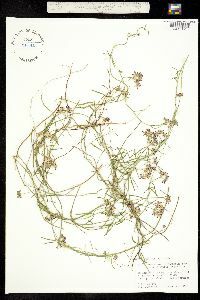 Plant: Perennial herbaceous vine; stems glabrate or sparsely pubescent at the nodes; milky sap Leaves: ovate to mostly lanceolate or linear, cordate to hastate, sagittate or truncate at the base, rarely obtuse, the margins flat, 1-8(-10) cm long, sparsely pubescent to glabrate on both surfaces, the petioles 0.2-4 cm long INFLORESCENCE: UMBELS 5-30 flowered, the peduncles mostly 1-6 cm long, the pedicels with spreading or curved hairs Flowers: 5-7 mm long; calyx pubescent to subpilose, the lobes ovate to ovate-elliptic, mostly 2-3 mm long, less than 3 times longer than broad; corolla rotate to broadly cup-shaped, bright purplish to white, pubescent outside, minutely so inside, the tube 1.5-2.5 mm long, the lobes ovate to ovate-triangular, 4-6 mm long; crown ring free from the base of the vesicles, 0.2-0.5 mm high, the vesicles arising from a short column less than 1 mm above its union with the corolla tube, ca. 1.5-2.5 mm long in the upper portion, longer than broad, rounded at the top and smoothly contoured on the tangential surface, indistinctly constricted at the base; column 0.5-1 mm high beneath the anther wings, these 1-1.2 mm long; corpusculum ca. 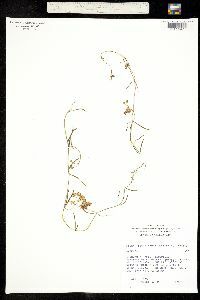 0.2 mm long, the pollinia 0.7-0.8 mm long Fruit: FOLLICLES single, lanceolate-attenuate, 6-12 cm long Misc: Desert washes and slopes, canyons, floodplains, disturbed sites Notes: pollen in sacks (pollinia); seeds with hairs attached References: E. Sundell. Asclepiadaceae. JANAS 27:169-187. J.C. Hickman, ed. The Jepson Manual.ASU specimens.